The transfer of tablets demands more than a required throughput. The quality of the product being transferred dictates system design. Mechanical damage, chipping, scratches, wear, coloring etc. – all have to be avoided. Tablet Vacuum Conveyors from Volkmann offer damage-free pneumatic conveying for many different and sensitive tablets and other small parts. Tablets are either picked up from containers, or directly from the tablet presses, load containers and filling (or packaging) machines without generating dust. Volkmann Tablet Vacuum Conveyors are easy and flexible to install offering a reliable and safe automatic material supply, even with applications having limited headroom. All contact surfaces are wear-free and are made with FDA-approved, shock absorbing materials. Additionally, the patented process for the air flow realized inside the conveyors allows for the reliable and gentle transport of highly sensitive materials. 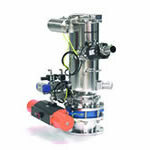 Volkmann can supply individually customized Tablet Vacuum Conveying systems and complete Vacuum Conveyor solutions, e.g. for the conveying and dosing of all raw materials and APIs. Talk to us and tap our experience in chemical and pharmaceutical bulk materials handling.